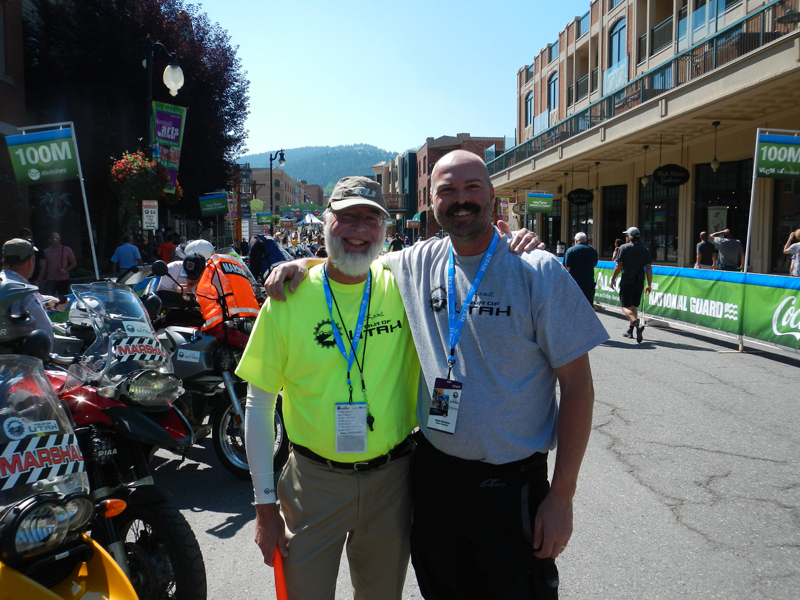 and moto marshal respectively at the 2014 Tour of Utah. Although I inquired rather late, a cancellation opened up a slot for me to work as a traveling course marshal in all seven stages of the 2014 Tour of Utah. I was informed that my duties would include every aspect of making the field of play safe for participants and spectators. I really didn’t know what this would entail, but was told that I would receive further training upon my arrival in Cedar City and placement on a team with other course marshals. I quickly complied with all the requests for personal information—and there was a lot. You’d have thought I was applying for a top-secret government job. I sent them copies of my driver’s license, passport, and Social Security card. I answered questions about my driving record, health, education, and work experience. A few days after completing all the paper work, I set off for Cedar City a day before the race was scheduled to begin. After arriving in Cedar, I went to the race headquarters to pick up my official credentials, clothing uniform, per diem allowance, and housing information. After getting settled in the motel, we met that evening for orientation, training, and to establish teams. It seemed that the majority of the people had been marshals with each other before at races in California, Utah, Colorado, and Canada. In fact, some seemed to have worked as many pro races as they possibly could each year. I really felt like a rookie. I chose to join a team led by an experienced couple from Georgia—Larry and Pauline. 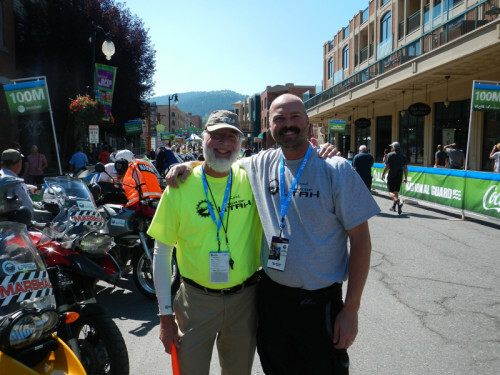 They had first begun working at the Tour de Georgia (no longer contested) and had worked in over 35 different bike tours in the U.S. and Canada. Team Seven was comprised of nine people: Larry (captain/navigator), Pauline, Mark (driver from Park City), Susan (from California), Mia and Misha (sisters from Cedar City), Jenn and Rose (from Cache Valley), and me. With five us being first-time rookies, it was good to have only a single assignment for Day One. Larry thought it best that we leave Cedar before the start of the race, so we could drive the course and see where to position each of us. Twenty miles north of Cedar we stopped to explore the petroglyphs and rock art in the Parowan Gap and have a team picture taken. Then we ventured up the steep-pitched road to Cedar Breaks and Brian Head. Our assignment covered a fifteen-mile stretch of highway between Mammoth Creek and Duck Creek Village. Larry trained us in the art of being a course marshal. This involved learning the best place to stand to be seen by oncoming racers and their support teams. I also practiced the measured cadence of waving the red directional flag while simultaneously blowing a whistle. Adam had warned me before leaving Cedar, “Dad, I don’t want to see you being a sloppy flag waver.” Adam was one of the lead motos as they approached my turn-off leading out of Mammoth Creek. He gave me the thumbs up when he passed. I had been trained well. Bursting with confidence, I faced each succeeding day knowing that I had the right stuff to be a good course marshal. I had passed the critical scrutiny of my son. Larry and Pauline instilled in us that we needed to do the best job possible. I can say that by the end of the race, we were proud of our efforts. It was also nice to hear compliments and recognition of our team’s work from our marshal supervisors, too. Our van driver, Mark, picked us up in time to return us to Cedar so we could see the race finish. Very exciting. On Day Two we had another single-drop assignment stretching about ten miles between the town of Boulder and the KOM location on Hogsback. I had ridden the Hogsback (see Fall/Winter 2009-10 Cycling Utah issue) several years before on a fall bike ride from Kansas to San Francisco. I went the opposite direction from that taken in this race. They had to hump that steep grade that I had ripped down. When the bike entourage passed our stretch and we had collected all our team, we took our place in the line of vehicles at the back of the convoy. We then engaged in what became the favorite sport of traveling course marshals—looking for musettes and water bottles thrown aside by the racers. Some in our van tried to complete collections of these items cast off by all sixteen bike teams while others collected only the most sought-after items. Competition was stiff. In fact, some members of our team thought that the most exciting action occurred in this race behind the race. The logistics of this race just in housing all of us in this convoy was immense. There were almost eighty of us working as course marshals. We were just one part of a very large group which included racers, support teams, luggage trucks, media, VIP’s, law enforcement, race officials, medical staff, etc. It made for a mind-boggling nightmare to find places to house everyone each night. As we moved ever northward in each stage, we spent two nights in Cedar, one in Provo, two in Ogden, and three in Park City. Because of housing availability in some of the areas, we were necessarily spread out in different locales. On the night when we were bedded down in a Provo motel, many of the racers were at motels back in Richfield, for a race the next day, which started in Lehi. I’m hooked in this marshal work and can’t wait for the next Tour.